An interview with Enrico Letta: Italy’s prime minister on his country’s economic troubles. An interview with Italian Prime Minister Enrico Letta. 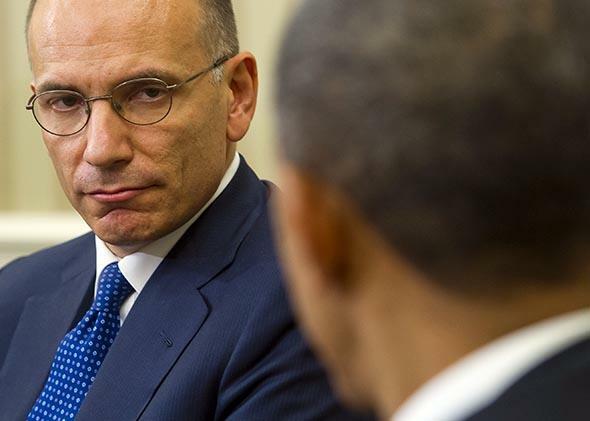 President Obama, right, and Italian Prime Minister Enrico Letta meet in the White House on Oct. 17, 2013. Lally Weymouth: What will you discuss during your meeting with President Obama? Enrico Letta: We have to reaffirm the strategic interest of our friendship—Italy and the U.S. We have to work together on many issues. We share the fact that after five years of crisis and austerity in Europe and the world, we need to have years of growth. Second, the main concern is instability. L.W. : Are you worried about refugees coming into Italy if Syria continues to be so unstable? E.L.: We are, because the situation today is out of control in Libya, Egypt, and Syria. We had a terrible tragedy [of refugees drowning] around Lampedusa [an island south of Sicily] some days ago. We [have] decided … Italian ships and aircraft will patrol the sea between Libya, Lampedusa, and Malta. L.W. : Is that to let immigrants in or keep them out? E.L.: To rescue them if their ships capsize. We had a rescue operation two days ago saving 150 people, children and women. And of course we have to block the Libyan human traffickers—those who are creating these ships. L.W. : You want to stop the organizers? E.L.: The main problem is that Libya today is a weak country, so it is very difficult to deal with them but absolutely necessary to help. First, we must rescue people in the sea because we can’t [allow] the Mediterranean to become a sort of death sea. Secondly, we also have to deal with the failure of some states, like Syria. We want to deal with refugees. In our constitution there is the right to accept refugees. The main problem is that we had a big change in migration trends. … Ten years ago the migration trends were completely focused on economic reasons. Today, more than half are refugees from failed states. L.W. : You have Syrian refugees? E.L.: Yes, in Lampedusa, for instance. L.W. : Many analysts call Italy, Spain, and France the troubled countries of the eurozone. Can Italy do enough to remain in the eurozone? E.L.: We need to have a banking union in the European Council because if we had had the banking-union mechanism [whereby failing banks can be aided or shut down], we would have avoided the banking crises. … Second, we need to have a stable situation in the markets. Since one year ago when [European Central Bank President] Mario Draghi said the ECB would do whatever it took [to buy government debt], that was the big change and stability came for Italy, Spain, and France. … [This week] we approved in the [Italian] Council of Ministers the budget for 2014. And for the first time in five years, the general debt will be lower. The deficit will be 2.5 percent, so it will be lower than the 3 percent of this year. L.W. : How will you do that? E.L.: By cutting public spending. L.W. : You’re going to cut public spending? But haven’t the unions already threatened to strike? E.L.: Yes. They are not very happy, but I will convince them. L.W. : Isn’t Italy’s deficit to GDP at 3.3 percent right now? E.L.: We’re at 3 percent for the deficit. … The general debt today is 132 percent. … Next year I hope we will have 130 percent. L.W. : You’re talking about debt-to-GDP ratio? E.L.: Yes, it is. The main problem is the lack of growth. [But] the debt next year will be decreased, the deficit will be lower, and public spending for the first time will be lower. And, fourth, we will reduce taxes for the first time in years. L.W. : From what to what? E.L.: Today we have a tax threshold that is 44.3 percent. At the end of three years, it will be reduced to 43.3 percent. L.W. : If you cut all these things, where will you get revenue? E.L.: From a privatization process. I think now the markets are ready to buy and we will sell public assets. … Fincantieri, for instance—a shipyard. We will sell one part of Terna, which is the national electric grid. Of course, not 100 percent, but 49 percent. We will present this privatization plan, and I think it will be a very important step. … The other main issue is the cut in public spending. That is, of course, not easy, but I think it is necessary. L.W. : In order to attract outside investment? E.L.: In order to have the budget completely under control and to have low interest rates. That, for a country with such big general debt, is absolutely decisive. We need low interest rates. Today, I am very happy that we have reached the lowest interest rates in two years. E.L.: It is 4.2 percent on a 10-year bond. It is the best result in two years. For me, personally, it is a big result because the success of my government is linked to lower interest rates. It is a way to restore confidence in the markets. L.W. : You feel you are restoring confidence in the markets? E.L.: Today’s result is a fact—it is a concrete achievement. I am happy about that, and we have to continue. L.W. : What are the central elements of your economic program? E.L.: Cutting public spending, privatization and, of course, the cut of labor taxes. That is the main issue for pushing growth and jobs. L.W. : What is the reaction of the labor unions? E.L.: They are happy about it. It gives companies the chance to give more jobs with lower taxes on labor. The problem with unions is that they want more cuts on labor taxes. But of course, to cut labor taxes is not easy because we need money. L.W. : You feel Italy is on the path to financial recovery under your government? E.L.: Yes, we are, because next year we will reach the targets I stressed, and these targets are absolutely necessary for having lower interest rates. L.W. : What about your banking sector? Many analysts worry about the European banks. E.L.: Our banks were obliged to recapitalize with public money for 3 billion euros in these last five years. It was, in the eurozone, the lowest level of public money for saving banks in Europe. It was a demonstration of the solidity of our banks and it was just for one bank—Monte dei Paschi. L.W. : Only one bank needed capital? E.L.: Yes, and only 3 billion euros, which is peanuts in comparison to Ireland, the U.K., Spain, and so on. This is the demonstration of the solidity of the Italian banking system. We in our budget passed some important tax rules to give them more capitalization. L.W. : What if Italy ran a stress test? The U.S. banks had to mark down their balance sheets. E.L.: The ECB and the banking authority at the European level … are very tough with the stress tests. And the Italian banks passed. L.W. : So they don’t need capital? E.L.: No, they are good. L.W. : Didn’t the ECB give Italy a round of LTRO [long-term low-interest] loans? E.L.: The ECB, of course, is playing a very important role at the European level for stabilizing the euro and for creating a stable situation for the banks. L.W. : Are banks able to extend credit to small and medium-size businesses? E.L.: In the budget law, we put a new capitalization for the funding of [small and medium-size enterprises] that is a way to put a public guarantee for loans focused on [them]. L.W. : You have a dangerously high level of debt-to-GDP … and the [International Monetary Fund] just said you have a negative growth rate of 1.7 percent. E.L.: In the year 2013. But our forecast for 2014 is to have 1 percent growth. And the IMF forecast is 0.7 percent for next year, so it’s not so different from ours. L.W. : Does this mean you are going to get rid of some regulations and make life easier for businesses? If so, how? E.L.: Yes, a big part of this budget law is cutting red tape. That is decisive for helping Italy create new jobs. The other main issue I mentioned is the cut of labor taxes. It will be lower to give an incentive to give jobs for youth. L.W. : Is it impossible for a business to dismiss an employee? E.L.: In a company with [fewer] than 15 workers, you can fire a worker without any justification. L.W. : And otherwise it’s impossible? E.L.: Above 15 workers, it is different. You have to deal with trade unions on that. Coming back to the creation of jobs—it’s very important that in the last five months, we had an important reform, cutting labor taxes for new jobs for youth, and that is creating opportunities for workers younger than 29. L.W. : You have a huge problem with youth unemployment. E.L.: We have around 38 percent youth unemployment. That is our nightmare. L.W. : So do you want to cut some of the red tape and make Italy more market-friendly? E.L.: We already did for some businesses, and we are passing other laws for other businesses. L.W. : What did you think of former Prime Minister Mario Monti’s austerity plan? E.L.: Monti did a great job because it was necessary at that moment to cut the budget and to cut public spending. It was the only possibility to avoid Italian failure. Now it is my job to continue the necessary fiscal consolidation, which is why I’m cutting public spending, privatizing, and so on. But now it is necessary to push growth and youth jobs. L.W. : Do you think you can attract outside investment? E.L.: We wrote a plan named Destinazione Italia. This plan is a group of new rules with a fast track for foreign direct investors. … We need foreign direct investment. L.W. : Which means creating jobs and growth. L.W. : I understand that in Italy hiring is based on connections, not on merit. E.L.: Oh yes, of course, it’s a very big problem. We need more meritocracy. Italy needs to cut informal links. It is one of the traditions of our country, it is a cultural problem. We need to change generations. … Not only in the post of prime minister but also in the academies, in entrepreneurship, and in the trade unions. We have to leave the geriatric Italy. My big mission is to give a big opportunity to a new generation. L.W. : You are so young. What are your dreams? E.L.: My true dream is to allow my country to change and give the opportunities to the new generations. … Italy was a country in which the politicians were old, the professors were old, and so on. We need to give opportunities to the youth. This is my mission. L.W. : If you succeed, will this make Italy fit better into the global world? Italy has lost some of its competitive edge to China and other countries. It used to be a leader in manufacturing, and now it has a harder time competing. E.L.: Exactly. Italy had good performance … but in the ‘80s and the ‘90s we allowed the rise of the general debt. … [Over time] Italy [became] the country with the biggest debt in Europe, and this is why we had such a crisis in the last years. And this is why today my job is to create again confidence in the markets. L.W. : Do you think you can get that debt down? E.L.: Yes, next year for the first time in five years, the debt will decrease. L.W. : Can you get the debt down to a reasonable level? E.L.: Of course. For cutting debt in the long term, we need growth. L.W. : You either need growth or tax increases or spending cuts, but your coalition partner [the center-right People of Freedom Party of Silvio Berlusconi] won’t let you raise taxes, correct? E.L.: Yes, that is correct. But the crucial point is that without growth, it would be impossible to cut the general debt. L.W. : The EU could lose Greece, but to lose Italy is almost unthinkable. Do you think Italy can stay in the eurozone? Do you want Italy to stay in the eurozone? E.L.: Yes, there are no problems on that. L.W. : Do you believe in a united Europe? E.L.: Yes, I completely believe. Next year Italy will be the president of the European Union in the second semester. My mission will be to try and have steps toward a more integrated European Union. I think the European Union needs Italy and needs Italy to be pro-European. I am pro-European. L.W. : What do foreigners think of what is going on here in the U.S. with the government shutdown? Do you think it affects our credibility in Europe?